CORONA, CA--(Marketwire - April 28, 2008) - For parents looking to add more water to their toddlers' and preschoolers' diet, Hansen's Natural, a leading marketer of natural and alternative beverages, launched the new Organic Junior Water beverage. Flavored with just a splash of juice, Hansen's Organic Junior Water keeps kids happy with taste and parents happy with ingredients. 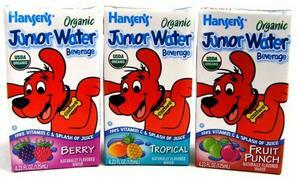 Featuring beloved children's icon Clifford the Big Red Dog*, the new product line is USDA Certified Organic and packaged in a 4.23 fl.oz aseptic box that fits perfectly into little hands. Hansen's Organic Junior Water offers young children 100 percent of their daily vitamin C requirement and contains no preservatives and no artificial colors. Each serving has less calories and sugar than other children's beverages and is available in three popular children's flavors: berry, fruit punch and tropical. "Parents are looking for organic, healthier options for their children," said Jaime Phan, senior brand manager, Hansen's Natural. "They want to ensure that the flavored water beverage they give their young kids tastes great and contains the best natural ingredients." "I'm a mother of 2 and I can attest to the constant struggle to get my kids to drink more water," said Claire Gallacher, from Walnut Creek, California. "They don't enjoy the taste of plain water so Hansen's Organic Junior Water is the perfect solution and very convenient when we're on-the-go." Light and flavorful, Hansen's Organic Junior Water combines taste with nutrition for parents and children alike. Hansen's Natural understands that it's important for young children to stay hydrated as they maneuver the playground and discover the world around them. Hansen's Organic Junior Water beverage will begin shipping this May to major grocery and natural food stores nationwide and the products will appear on shelves this summer. For more than 70 years, Hansen's Natural has provided consumers with superior quality and delicious, healthy and natural beverages. Consumers can trust the quality of our ingredients as Hansen's Natural brand products are free of preservatives and contain no artificial colors or flavors. Based in Corona, Calif., Hansen's Natural markets and distributes Hansen's Natural Sodas, Hansen's Natural Sparkling Refreshment, fruit juice Smoothies, Junior Juice, iced teas, juice cocktails, apple juice and juice blends, Blue Sky beverages and Fizzit. Please visit www.Hansens.com or www.DrinkJuniorJuice.com for more information. * Clifford the Big Red Dog is a registered trademark under license by Scholastic Entertainment, Inc.